The stuffed animals are used by police officers to help comfort children they encounter during police calls and crime scenes, incidents that are often highly traumatic for children in the homes, said Fresno Police Department detective Sgt. Diana Trueba. The students delivered the stuffed animals to the Manchester Center substation of the police department Feb. 16. "We were overwhelmed with the support of the students, not just for the police department but for all the families who will benefit from the teddy bears," Trueba said. "That was a lot of teddy bears." The students are members of the Kiwanis Kids service club for fifth- and sixth-graders. Sixth-grade teacher Anita Ullner is adviser to the club. 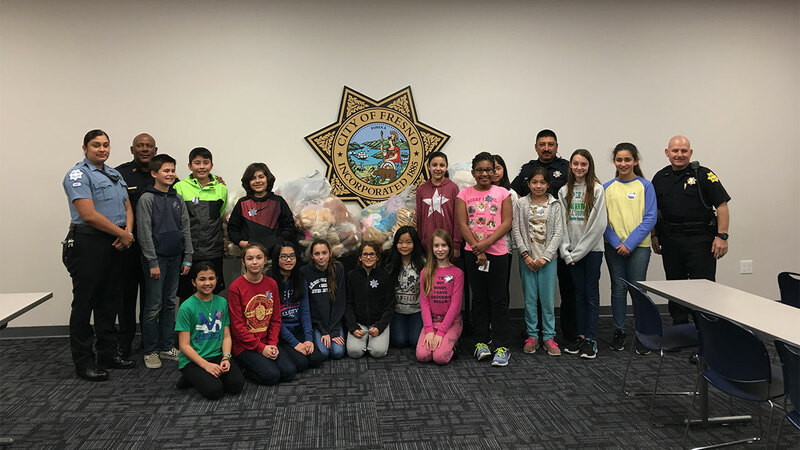 The students learned through a volunteer who works with the police department that the department has an ongoing teddy bear drive. The project appealed to the students, Ullner said, and they wanted to help. "We heard about what the struggles were for some kids if something happens," said Kiwanis Kids vice president Dominic Marsella, a sixth-grader. "We wanted to find a way to help them out and we thought teddy bears would be good." Dominic said a stuffed animal provides "a feeling of having someone there. It comforts you and it's soft and it's nice." Dominic said the police department was happy with the donation and surprised at how many stuffed animals the students delivered. "They were glad kids were putting back into the community and helping out," Dominic said. Dominic said students enjoyed making posters to encourage students to donate stuffed animals, and the feeling of "knowing that we were helping out."